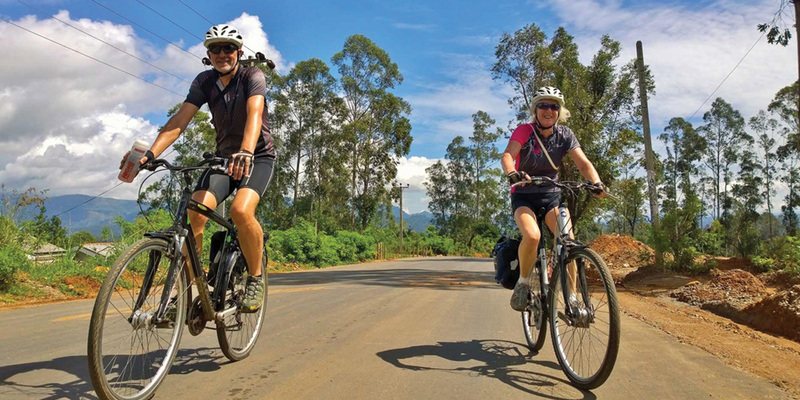 Our Self-Guided Cycle trips take you on an intoxicating and exhilarating self-propelled tour of Sri Lanka’s most breathtaking sites and scenery. You will ride along the south coast and through the beautiful Lowland Forest. Highlights include endless beaches, giant Buddhas perched on top of jungle hills, secluded temples overlooking rice paddies, riding through plantations of cinnamon, rubber, cashew nuts and bananas. This forest is full of wildlife ranging from monkeys and mongooses to monitor lizards and even the occasional wild elephant. There’s no better way to get up close to the local wildlife than on a bike. The ride starts in the surf hotspot of Hikkaduwa. From here you ride along the palm-fringed coast to the historic port of Galle with its UNESCO World Heritage Fort. Next stop is the beautiful beach resort of Mirissa before you finish the ride on the perfect beaches of Tangalle. Get on your bike and explore some of Sri Lanka’s most amazing and unforgettable locations!